Hi there! Yup, it's been another 'while', since my last posting. But then, I'm sure you're not just sitting around waiting to see what I've been up to. In any case, here's the news... Elizabeth got me a new quad-copter. You'll notice how I avoided calling it a 'drone'. The latter seems to have been stuck with such a nasty connotation, just because a few dim-wits mis-behaved with theirs. The first quad-copter she got me (Proto-X FPV) was a great one for learning on, as I could easily use it indoors, with minimal risk of damage to either the 'copter, or our furniture. It could easily rest in my hand. However, the camera was sadly lacking in decent clarity, contrast and white balance. Additionally, keeping a steady shot was almost impossible. Then came the Blade 350 QX3! This one allows me to slap my GoPro Hero 3+ Black on there and get some decent shots. Although not the same smoothness as shot by those with gimbals on board, this combination does an 'ok job'. It even returns to where it took off, without any input from me, if needed. Great idea for panic situations. 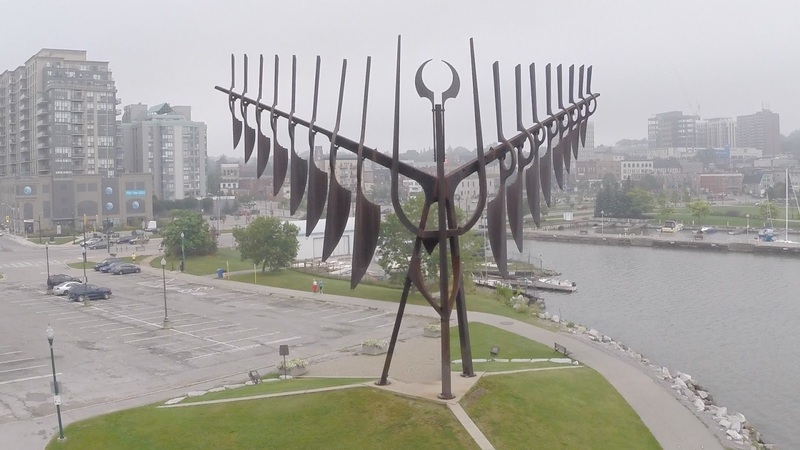 The other day, I took it to Barrie's landmark, Spirit Catcher and did a few moves around it. I couldn't take much time as I was on my way to work. Anyway, here's a quick (one minute) video with the GoPro set to 1080p. Please let me know what you think?